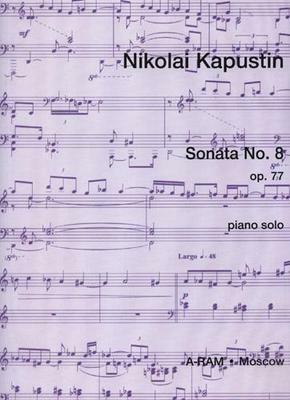 Kapustin's eighth Piano Sonata, op 77, was composed in 1995. In this single-movement work he develops three contrasting themes: a rhapsodic, Scriabinesque opening section that reapperas several times in different guises, a quirky, offbeat scherzando that develops in rhythmic complexity, and a slow, romantic interlude which, towards the end of the piece, reappears triumphantly with the left hand chordal accompaniment of the opening section. This reaches a breathtaking climax, but the work ends in a whisper. What do you want to know about Sonata No 8 op 77 by Nikolai Kapustin?